Save the hassle of finding a parking spot , park free and take the free shuttle to the fair! 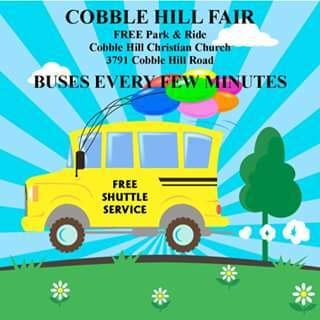 The Cobble Hill Fair provides free shuttle service from the Cobble Hill Christian Church parking lot at 3791 Cobble Hill Road right to the fair grounds. It runs all day, leaving the parking lot and the fair-grounds every few minutes. And it is absolutely free! Turn onto Cobble Hill Road at the Valleyview intersection where Cowichan Bay Road and Cobble Hill Road meet the Trans Canada Highway. Traveling south on Cobble Hill Road, the turn off to the church parking lot is 5 km from the highway. Parking attendants will ensure your vehicle is safely parked while you enjoy the Cobble Hill country Fair.